The election of Yingluck Shinawatra will upset Bangkok’s political establishment and military. Will a coup follow? Against a backdrop of popular discontent and social strife, Yingluck Shinawatra, sister of former Prime Minister Thaksin Shinawatra, was swept into office Sunday on a tidal wave of support from the poor, rural Thai majority. Yingluck will likely become Thailand’s first female prime minister if she takes office as expected in August. While perhaps unsurprising given her poll numbers heading into the election, the results are still stunning: Yingluck’s Pheu Thai Party looks like it may have secured 263 out of a possible 500 seats. Such a sizeable win is significant because Pheu Thai wouldn’t have to seek out secondary parties to form a coalition government (although recent reports suggest Pheu Thai is anyway going to form a coalition with four smaller parties to give itself additional support). For a while, despite the litany of bloodless military coups, Thailand’s political process had been seen by many observers as a somewhat quiet process. This changed dramatically in 2006, when Thaksin was ousted in a military coup while traveling abroad. During elections the previous year, Thaksin had galvanized the rural constituencies with populist programmes including farm subsidies and cheap access to quality health care; the result was the largest electoral victory in Thailand’s democratic history. His overthrow touched off a series of events, including the politicization of the Supreme Court, the disbandment of political parties, and the constant shredding and rewriting of the Constitution. The chaotic political climate prompted massive street protests. In 2008, the People’s Alliance for Democracy (the Yellow Shirts) – representatives of the oligarchic elite of Bangkok – filled the streets of the capital and eventually seized control of the international airport in an attempt to remove the pro-Thaksin government. Their efforts were successful following a legal adjudication by the country’s Supreme Court. But this weekend’s results are a clear indication that the lower classes in the country have been given a renewed voice in the political process, and that they intend to maintain an active role in how the nation is governed. Participation was an integral part of Thaksin’s platform when he was first elected in 2001 by mobilizing support in the poorer areas and capitalizing on Thailand’s class divide. The results will doubtless unsettle the Bangkok political establishment of royalists, socialites, and members of the military, traditionally Democrat supporters. 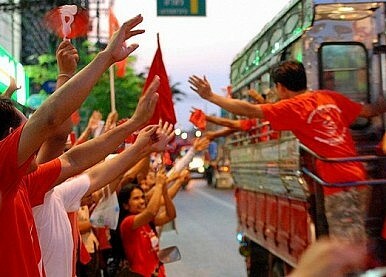 Meanwhile, Prime Minister Vejjajiva Abhisit’s cohorts demand that Thaksin, should he return to the country after nearly three years in exile in Dubai, serve the two-year prison sentence he was given after being convicted in absentia in 2008 for ‘conflicts of interest’ (read: corruption and graft). As prime minister, Yingluck could commute her brother’s sentence, enabling Thaksin to return to Thailand and, in all likelihood, serve in a behind-the-scenes role in the new Pheu Thai government. Abhisit, whilst conceding the election, asked Thais to choose reconciliation over additional strife. Defence Minister Gen. Prawit Wongsuwon, speaking on behalf of the military establishment, stated that the army would accept the electoral results and wouldn’t intervene. Such statements are sure to be met with scepticism by an electorate that has seen its fair share of military coups since the country’s transition from absolute to constitutional monarchy in 1932. Indeed, the BBC’s Rachel Harvey has suggested that Thaksin’s return could provide the impetus for the military to step in. Thaksin’s status, the role of the military, and the possibility of renewed street protests from the anti-Thaksin, Bangkok elite crowd – there’s plenty to keep an eye on as the Pheu Thai-led coalition government takes office. The Diplomat speaks with Dr. Vikram Nehru about the root causes of political tensions, the regional implications, and the fate of Thailand's democracy.